Cornscala (any version) vs. Forte III ? I'm still looking to go high efficiency/sensitivity and Forte III didn't work out. I've only heard Cornwalls once and didn't care for them (body armor on)✌️. I'm intrigued by Cornscala as I think it would load up my room differently and with the different dispersion mid-horn carachteristics from a Cornwall may be more to my taste. 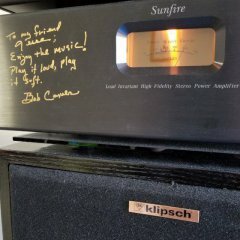 Has anyone ever listened to the Forte / Cornscala side by side, apples to apples comparison; same amps, sources, room, ect. My lack of do it yourself skills and lack of patience preclude me from assembling any kits so please don't suggest that! Strictly plug and play. Thanks. It might help us to understand what you didn't like about either the Forte or Cornwall's presentation so as to help us steer you in the right direction and answer your question more accurately. Everyone has their own requirements. Fair question. Cornwall exponential horn sounded shouty (is that a word) and a bit thin and they didn't sound coherent top to bottom. Main problem with Forte III in my room was with the way bass loaded up the room; it was a bit uneven and diffuse. I prefer a punchier bass and my thinking is the front ported Cornscala will load the room differently but still has a mid-horn with wider vertical dispersion. I have a difficult room with suckoutsuckouts and use bass traps that help a lot. Understand your points. jjptkd's idea is right on the money or something like a (I don't like to use the name since it really doesn't mean anything) :"Cornscala" might be to your liking. Bottom line, good bass projected in the room (ported to front) with a larger more open sounding mid horn. Passive radiators are good to try and keep the enclosure size down for bass extension but they aren't for everyone. Always liked the larger mid horn, such as on the Chorus II/Forte II/III much better than the small horn which can be much less smooth in it's presentation. If you were fine with the bass of the Cornwall, wanted to stay with the Cornscala version.... then I'd urge you to go 2-way. Hopefully, (since I don't know) the 2-way has a 2" horn. What kind of room (as in size) and budget do you have? Yup. With a pair of these I'm certain you will want one killer sub at least or a pair of quality subs to keep up (think 15"s and up). There is no "shrill or shoutiness" whatsoever with these. I word say effortless, detailed and buttery smooth instead. The bass is very tight and punchy, but not extended whatsoever. If Cory @MetropolisLakeOutfitters is still running a special on these, I would give them a strong consideration. I have owned all of the heritage line at one point and the Forte IIIs and Cornwall IIIs as well. IMO, in my room either of the forementioned speakers didn't even come close to the 396s. I know many here are very fond of the LA scalas. The footprint and cost kept them out of my listening room unfortunately. The small footprint and huge sound was the winner for me. Cornscalas I think will be difficult to A/B with production speakers since there will be an endless variety. They are after all custom speakers for the most part. I think with a pair of them it may invite endless tinkering as well. Just my thought. I had the Cornscala "C" version a few years ago. It was a very fun speaker, but for my money, the Forte III is the clear winner. Now if you were to upgrade the horns and drivers of the Cornscala, it might be a different story. Thanks for the replies. I looked at the 396 information and they are out of my price range. Also I'm looking to simplify my system and don't want to add sub(s). A Cornscala/Cornwall dimension speaker width wise is about all my space can handle. The back story and why I am reconfiguring. I have an almost all Bryston system which I very much enjoy and was hoping to build towards their new active system. It became apparent though that wasn't going to happen because of cost. I would have replace my speakers plus the cost of the crossover. I have six channels of Brystom amplification (albeit low power by Bryston standards and six channels is needed for their active system). I wanted to go active with Bryston for a few reasons: As stated before, I really like the sound of my Bryston Mini T speakers which were vertically bi-amped/bi-wired. I did this because I could, as I built towards my goal and it sounded better than running just a stereo amp as the Brystons are quite inefficient at 85db sensitivity. The active system also gains in efficiency which would make listening at lower levels more appealing and is one of my goals, and finally, the active system would allow me to do some room correction through the crossover. However, that is all water under the bridge. Bryston equipment is top notch, I like the sound and the company is second to none in terms of customer service so please no Bryston bashing---you can bash me instead! Since I couldn't have it all (full active and I should mention built as a system by the manufacturer so there is no playing with a mix and match equipment) I decided the next best thing for me would be highly sensitive/efficient speakers that are dynamic at lower volume. I have experience with Klipsch having owned Forte I, II and now III, KLF20 and Chorus II, used in a different room than I listen in now, and driven with everything from vintage Fisher to Bryston and other gear both tube and solid state. I also want to simplify; an integrated amp, speakers and sources, no more bi-amping ect. That brought me to try the Forte III's and where I am now. As for amplification, while auditioning and working with the FIII's I used a Bryston integrated and a Quicksilver integrated amp. I preferred the tubed QS amp. As for highly efficient speakers, I have tried Zu Audio Omens (didn't like in my room), have heard Zu Druid MKV's in a friends system and they sound nice but not my cup of tea, and finally Spatial Audio M3 Turbo's which I liked a lot. However, I feel the horn sound is more dynamic and has more impact than single driver, or open baffle designs I have heard. Again this is my feeling and my experience and do not want this to turn into a debate as I bare my audio soul. The Cornscalas seem like the next progression in my search for what I want to achieve. I did a lot of reading and the two way D is most interesting to me. Thanks for reading if you made it this far! I can hardly imagine any scenario where I would be happy with a bryston/klipsch combo. The very thought makes me cringe a little. I understand now why you were unhappy with the Fortes. But I think you are dumping the wrong piece of the equation. FWIW, I don't think you will be happy with any cornscala version either. BTW, this is not bryston bashing. Those amps have a place with very inefficient speakers (think magnepan), if you like that kind of sound. It is me telling you that bryston is not a good match in this instance. To audition I used a Quicksilver Integrated amp (el84/6bq5) I purchased in anticipation of keeping the Fortes. Although I do also have a Bryston B60R integrated that I also compared with the Fortes initially. I used the same amp on Chorus II for a while when I owned them. I do not take your comments as Bryston bashing at all but Bryston over the years has become much more neutral sounding. I am keeping both integrateds for now and selling my Bryston 2.5B SST squared amps not because I I don't like them but because I am ultimately simplifying . The QS sounds great with the Bryston speakers too at low volume, it's just underpowered.